Inspiring vision and strong mission statements are parts which define contemporary company cultures. 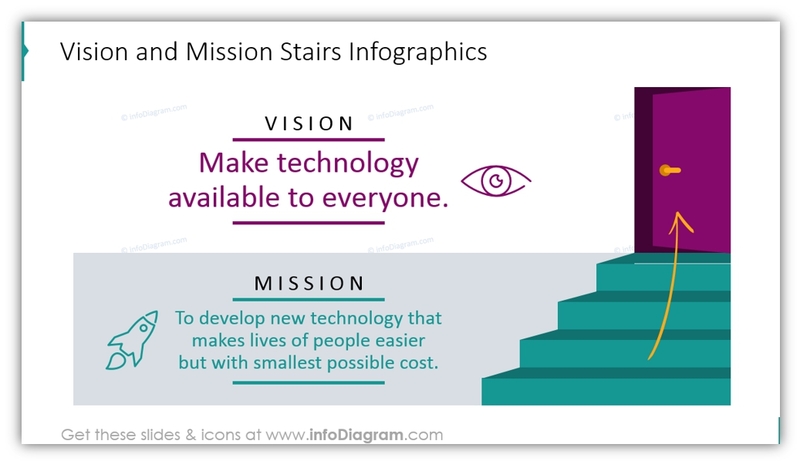 Presenting those statements to your team members in a catchy way, be can be a challenge, but we’ll help you 🙂 Here you’ll see several examples of vision and mission illustration in a PowerPoint presentation. 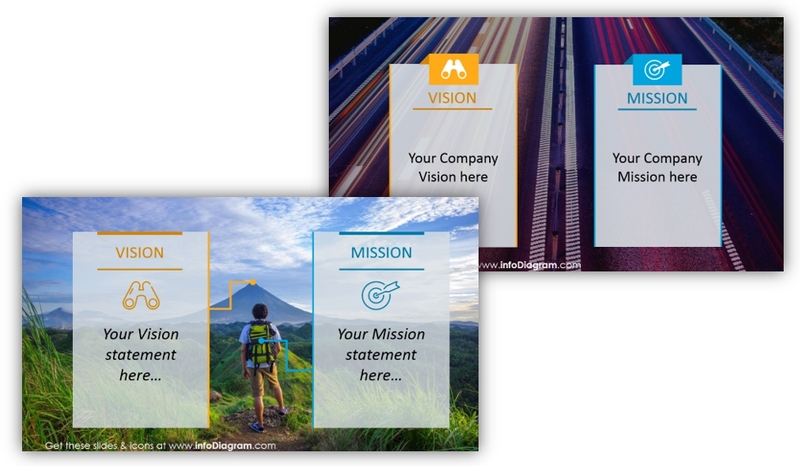 In many presentations, the vision and mission slides aren’t prepared with the attention those key company statements deserve. They are usually presented as a plain text quote. We’d like to inspire you by offering a few far more creative ways to communicate these impactful phrases to your listeners. 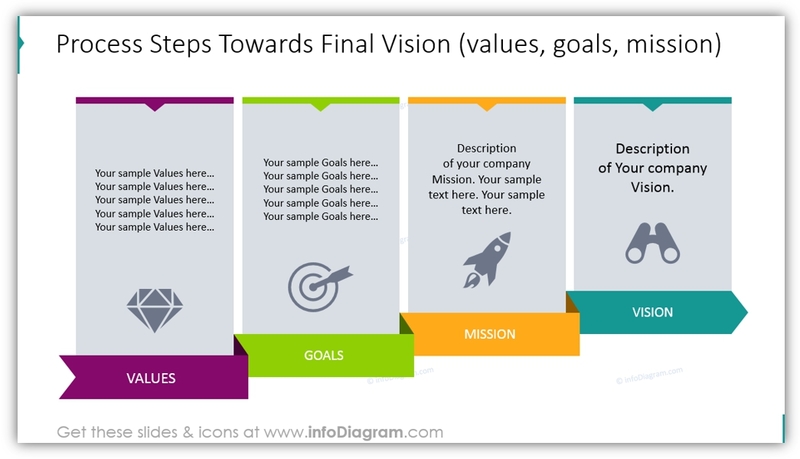 You can get all the icons and slides from the Vision Mission Presentation Template (see details by clicking the pictures). 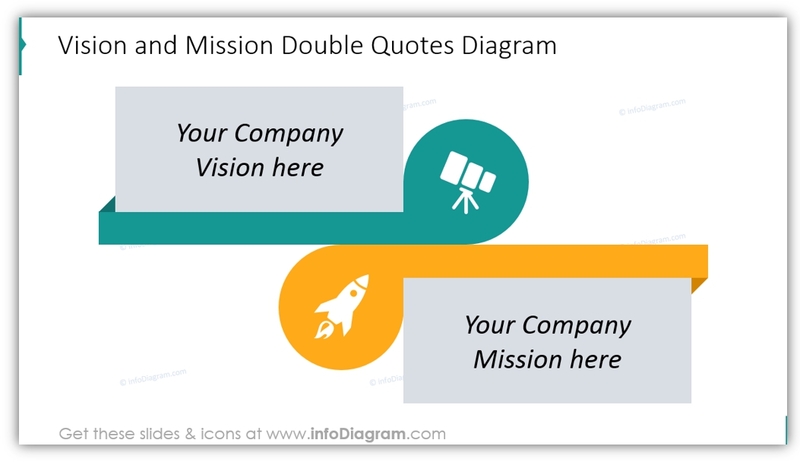 Putting a mission statement at the bottom of a slide and the vision above will symbolically show the step by step path towards achieving your company long-term goal (the Kaizen way). Door graphics at the staircase end can represent an exit strategy if that’s your intended direction. That is often the case for start-up pitch presentations when applying for venture funds. 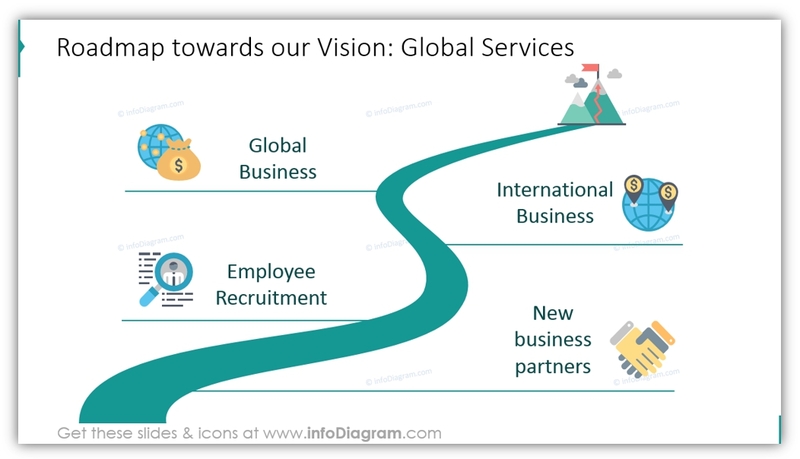 Using pictogram symbols (a telescope, a rocket and a diamond) will help your audience to identify the slide topic faster and see right away what you are talking about. You can add creativity and style by filling the vector shape with an appropriate photograph. (You can replace the picture inside with one you prefer. 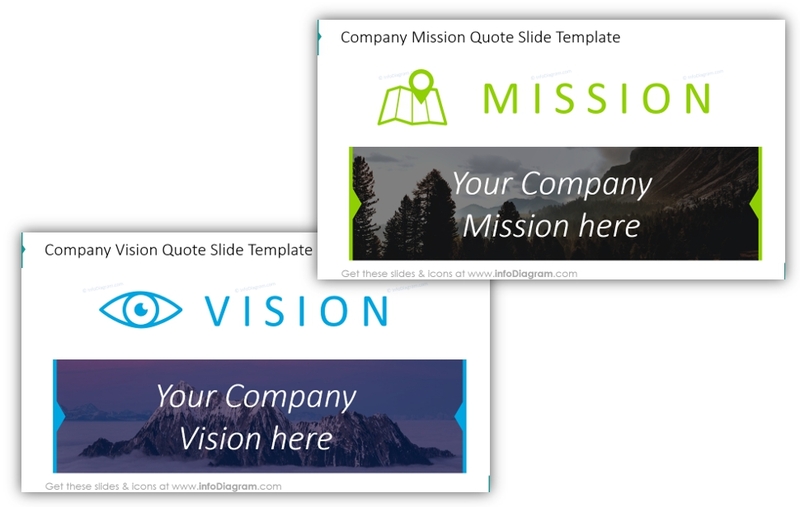 Those are editable placeholders inside the PowerPoint template). Such picture graphics are style neutral so you can add them to any presentation type. To be consistent with colors, choose a photograph with colors close to your logo or the style of your presentation. We strongly suggest following the minimalistic rule: less text = a better-looking slide. Before finalizing a slide ask yourself whether you need the full text or you can trim it somehow. Here’s an example: a dark picture, eye-catching icon and your most important statement in the white text. The roadmap timeline is another good idea you can apply when you’re talking about business milestones. That way listeners will see exactly where you are now, where you are going and what steps need to be taken on the way. Here’s another unusual way to talk about management strategy concepts, however it’s a very effective one. You can show how you’ll fulfill your mission by accomplishing goals, which will lead to your vision. 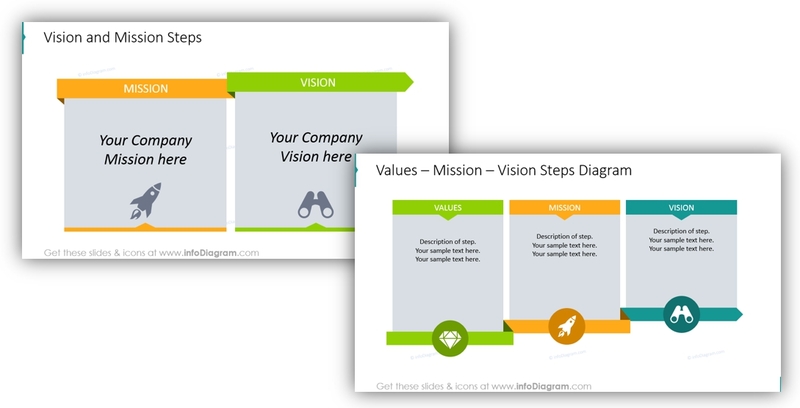 You can also show how the values connected are with the vision and mission of the company. 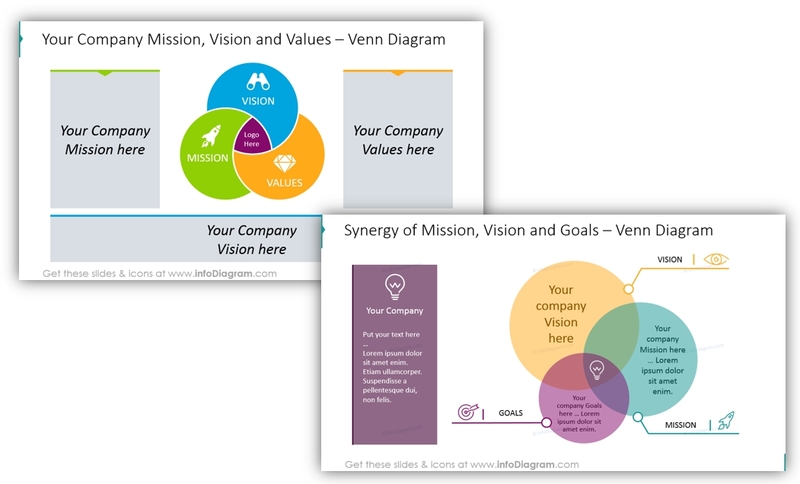 You can underline the synergy between the core company values, mission, and vision. Show that all three elements are important in helping to shape the overall organizational strategy. Venn diagrams look good in any style just use colors consistent with your brand or some neutral ones. You can easily use transparent or flat style Venn diagrams. If you like pictures more, then use the following slide template. Slides such as this with full-size picture background and text in semitransparent boxes will gain much more attention than other classical white background slides. Use them to create a surprising or more powerful effect. If you prefer to use a neutral background that will not steal attention from what you’re trying to say, apply a flat diagram on a plain white slide. This is a proven way to communicate your topic in a more effective way. 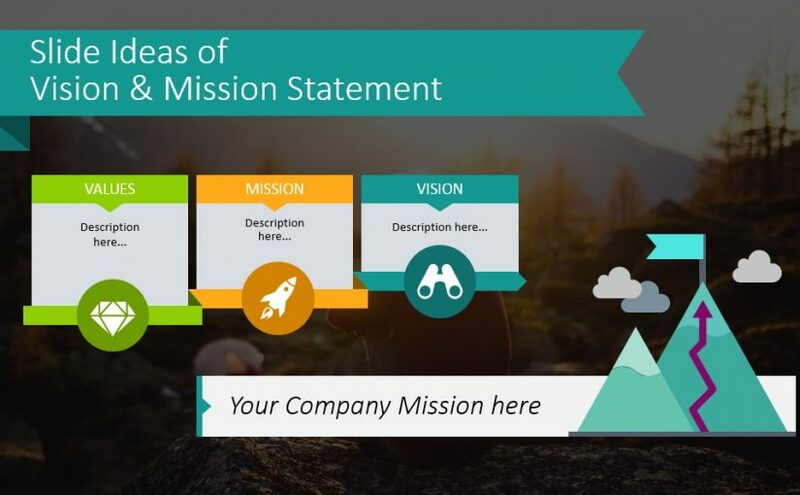 By the way, If you are only starting out and do not have your mission and vision formulated yet, this great article by Hubspot will inspire you: 17 Truly Inspiring Company Vision and Mission Statement Examples. Lindsay Kolowich shares the best examples of mission statements and carefully explains each one, plus defines the difference between vision and mission. Inspired? 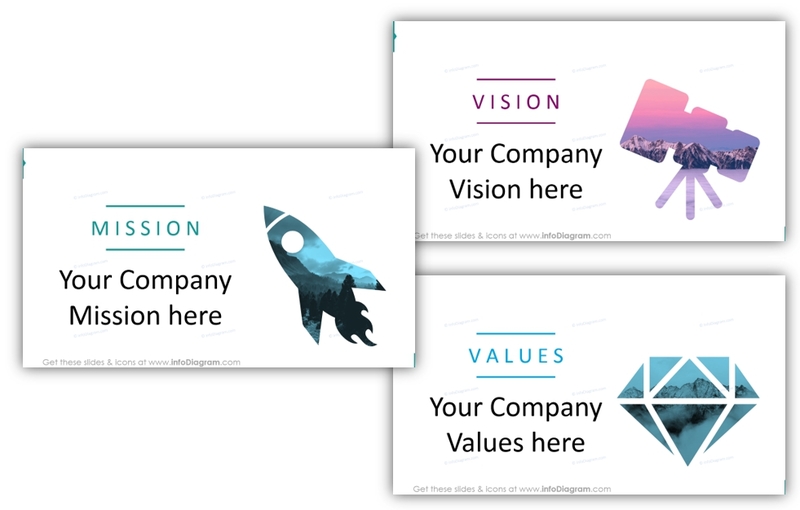 You see how you can replace an unattractive, text only vision statement slide with more colorful, eye-catching ones. A few simple diagrams or a proper image can work wonders. Now you can design simpler versions of those slide examples using basic PowerPoint shapes and vector symbols. 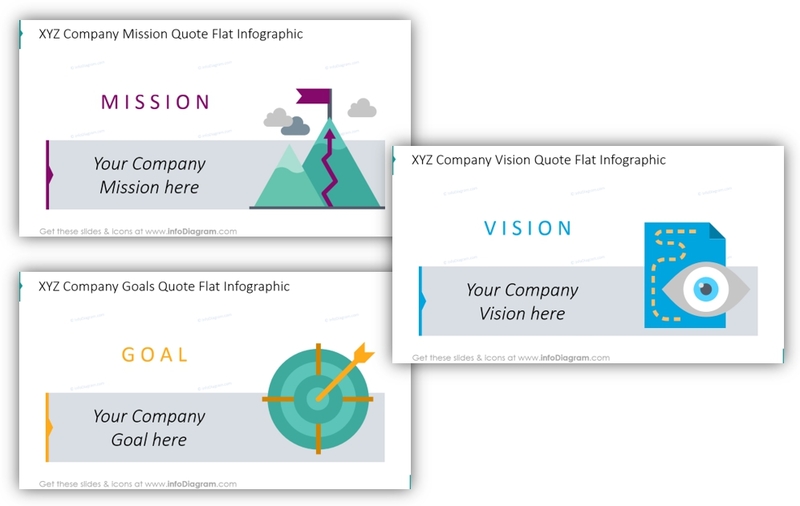 If you are lacking time or the skills to prepare presentation graphics like these, start with a pre-designed template. If one of our pre-designed slides doesn’t exactly look like the one you want to see in your presentation, make your own or modify one of ours to suit your needs. We also have general diagrams. You can check out our infographics bundles which include creative PowerPoint timelines, lists and comparisons.